Greetings and salutations! 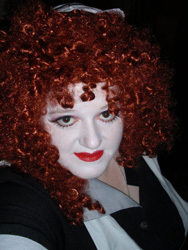 I'm Faith Duede, one of the cast leaders and founding members of the Michigan Rocky Horror Preservation Society. Once upon a time I also dressed up and played Magenta, but that was so long ago, any photos may have turned to dust by now. My first Rocky experience was back in the mid 80's at the Briarwood Mall movie theater (long since converted to a sporting goods store) in Ann Arbor, MI. My best friend and I had heard about Rocky and we couldn't wait to go see it for ourselves. We didn't want to look like newbies, so we each packed a grocery sack with toast, newspaper, lighters, rice, and old detergent bottles filled with water (those suckers shoot a LOT of water quite a distance!). Of course, being virgins, we had no idea what to do with any of that stuff, and we ended up coming home with most of it. The following weekend we went again and a tradition was born. I don't recall any formal cast in the beginning: people who came to the show dressed up would jump up and start performing scenes. So I decided to join in as Magenta. I was a redhead, and loved her character and her style. I remember trying a Toni Home Perm to try to get my hair to frizz just right. What I ended up with was something more "Roseanne Roseannadanna" than "Magenta." Unfortunately I had to largely drop out of Rocky when I went to college due to many life issues (class schedule, full-time work, and an ill mother). I still attended screenings where and when I could, supporting the local casts, but as theatres stopped showing Rocky in Michigan, they got fewer and further between. 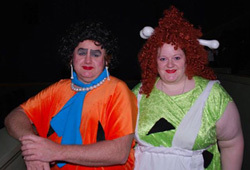 Fast forward to 2010, my husband (Rob) and I were talking about doing something fun to celebrate our tenth wedding anniversary the following Halloween (yes, we got married on Halloween). Since we'd thrown a costume ball for our wedding, we decided to renew our vows in costume. After going through several ideas, we stumbled upon our mutual love for RHPS. I contacted Kev Boycik of Cleveland's Simply His Servants, the closest regular show. We began going to Cleveland to see Kev's cast every month, which reignited the Rocky flame in both Rob and me. In October 2011 Kev remarried us in front of an audience at one of the Halloween shows. Our Christmas card that year featured Rob dressed as Sweet-T Frank, me as Magenta, and darling drag queen Trixie Gurleen (who stood up with us). 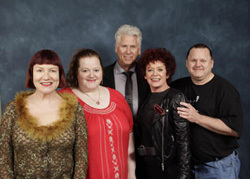 We have since taken every opportunity we can to travel to meet people and see Rocky Horror as many places as possible. In August of 2012, while helping a friend update a website about Rocky Horror showings in Michigan, I made a call that would change my life. I was simply calling Phoenix Theatres to find out if they planned to show RHPS for the Halloween season in 2012, and found myself talking to the chain's owner. He said they had *just* been discussing something like Rocky to help breathe life back into a property they had acquired, and wondered if I had a cast? I made some phone calls and emailed some friends who had been hoping to start a regular Rocky cast in the Detroit area, and in a few months the Michigan Rocky Horror Preservation Society was born. We have been lucky enough to make some wonderful friends in the Rocky Community and those friends have been so supportive and instrumental in helping us get going. I also had the great fortune to have Becky Milanio Koupparis [the former Berkeley Cast mistress!] living 15 minutes from me, who is now directing our crazy little group. I had never been part of starting a Rocky cast from the ground up (though I have a long background in theatre and have mounted stage productions in the past), and found that I had no idea what I was in for. This has been a crazy road, full of ups, downs, twists, and bumps. But we have gotten through it together and there is nothing that I would rather be doing with my life than helping to lead this fantastic cast and crew full of wonderful, amazing people.